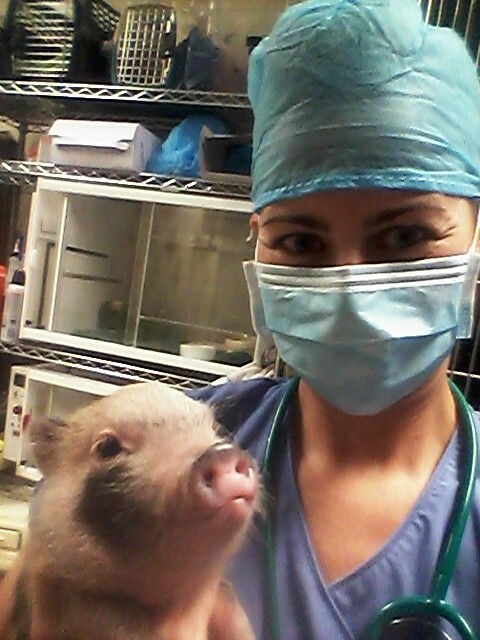 Q: Please tell me about your background & how you became a Veterinary Technician! A: I have a background in Marine Biology, and worked for Florida Fish and Wildlife in Manatee Research. We were responsible for the rescue and transport of sick and injured manatees. The injuries ranged from entanglement in crab trap lines, exposure to red tide algal blooms (which are neurotoxic and cause manatees to drown), boat strikes, or cold stress. I would participate in these massive rescue operations (getting a 1500lb manatee out of the ocean is no easy task) and transport the manatees to a rehab facility. But, I would not often see the medical treatment, or hear about the progress of a particular manatee after we rescued it, and I was always curious to know about the treatment and the outcome. 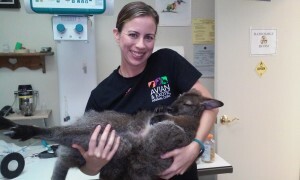 This is when I decided that I wanted to be involved in the medical treatment of animals (specifically, exotic animals). So, I went back to school to become a Veterinary Technician. Q: What is the best & most rewarding thing about your job? A: I believe we are called to be good stewards of (to take care of) everything that God has entrusted to us – this includes the environment and also our pets. I enjoy helping clients by teaching them to be good stewards of their pets and to help them in their stewardship by treating and caring for their pet when it is sick. The most rewarding thing is to see a client get excited when they understand how best to care for their pet, and to see a previously sick patient leave the hospital healthy and well. Q: How is working in an exotic-exclusive animal clinic different from a regular small animal practice? 2. Proper husbandry (diet, housing – lighting, temp, bedding, and social interaction) is the key to health for most exotic pets (more so than for dogs and cats). So, if you know how to properly care for your exotic pet from the start… chances are, you will have a long-lived exotic pet. This is why client education is so important and satisfying. Q: What are the challenges of working with exotic pets? A: The animals are smaller, and more fragile, because most of them are prey species. They hide their illnesses for a long time, and so good treatment is often the difference between life and death. Depending on the outcome, being involved in the treatment can be really happy and gratifying, or it can also be really sad. Q: Do you have any advice for people who want to become Veterinary Technicians? 1. Volunteer in a veterinary practice to make sure that you can deal with blood, urine, feces, vomit, bites, scratches, and to truly understand the role of a Veterinary Technician. If you can’t handle these elements, it doesn’t make sense to pay money for the coursework to become a technician. Ask questions about the job to the Vet Techs at the practice where you volunteer. 2. Once you’ve decided that you want to be a Vet Tech, go to school to get your license/certification. A licensed/certified tech is preferred to an on-the-job trained tech because they not only understand the Do’s and Don’ts, but they understand WHY the do’s and don’ts are important. Knowing WHY you do what you do, and WHY you don’t do what you don’t do is VERY important in a medical setting. 3. Learn the art of anticipation and observation — try to grasp ahead of time how to prepare for procedures. Learn what instruments, supplies, or medications you or the veterinarian will need for a given procedure or diagnosis, and try to get those things ready ahead of time. 4. Understand that you are relating with the client as much as you are relating with the pet. It’s not just about “loving animals.” If the client does not understand the problem, the pet is not going to remain healthy. Q: What do you like to do in your spare time when not working at the clinic? A: I enjoy hiking, camping, playing piano, playing cards, involvement in activities through church.